Oscar Bluhm was born in 1867 in Meissen outside of Leipzig. As is the case with many of the Eastern German artists of this period, there is little known about his personal life or formal training. Ostensibly, he would have been a member of the Berlin School, which was the hub of the region's artistic community. Bluhm was both a history genre, and portrait painter and many of his early works had wartime themes influenced by Anton Alexander Von Werner, the director of the Berlin Academy of Fine Arts, who was 25 years his elder and whose work was strongly influenced by patriotism during the Franco-Prussian war of 1870. 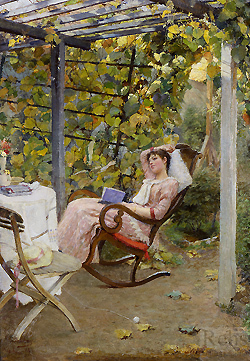 At the time that Bluhm reached the height of his career, it was the fashion to paint women at home or in the garden relaxing in natural positions, as opposed to formal portraits. Like his contemporaries Wladyslaw Czachorski who studied in Munich and Stanhope Forbes who studied for a time in Berlin, Bluhm painted these paintings to both flatter the sitter, and to please the viewer. It was the desire of the bourgeois to emulate the aristocracy, and these portraits of themselves enjoying their leisure time were a testament of their affluence.